We heard the buzz over the new line of batiks entering the market from Northcott Fabrics and we were excited to learn more so we sat down with Karen Gibbs, the Lead Designer for Banyan Batiks. We hope you enjoy learning about Banyan Batiks as much as we did! AQR sat down with designer Karen Gibbs to find out all about her designing and quilting styles. Karen Gibbs began her textile journey designing those quirky holiday sweaters that come back in fashion year after year. Karen has an extensive background in the textile industry with over 15 years of experience and is passionate about exploring and developing techniques used by artisans in Indonesia for the quilting industry. Karen has designed over 100 quilt patterns, is featured in several online instructional videos, and is an author with AQS. Her design experience spans across the home decor, fashion, quilting cottons and the batik industry. Q: Please tell us a little bit about yourself and your path to becoming the Lead Designer of Banyan Batiks. A: My initial experience in design was working with a company that manufactured novelty sweaters as well as knits and wovens to compliment them. I worked with an incredibly small team and as a result I was immersed in all aspects of the division, from design, to wholesale catalog creation and marketing, sourcing and production. One of Gibbs’s only remaining original quilts that doubles as a memory quilt made of her grandfather’s ties. Also, during that timeframe, I began quilting. Three times a year, we would see swatch cards or headers of newly released fabrics in different substrates and at the end of the season these would get discarded and as a fabric lover, that’s painful to see! I kept these fabrics and began working with them in my new-found love of quilting. I quickly learned these were very untraditional fabrics for quilting and that it was not the best idea to mix wool flannels with cotton flannels! The only remaining quilt I have of my initial first quilts is a memory quilt I made for my grandmother. 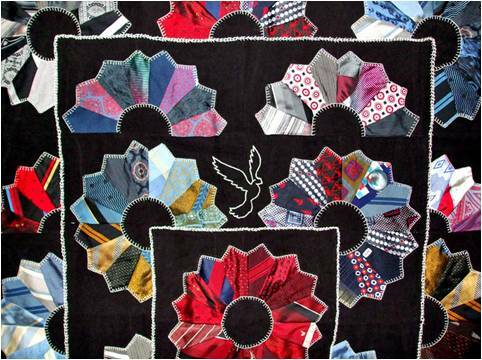 The quilt is made up of 92 of my Grandfather’s ties, in a radiating Dresden plate. Joining a quilt guild and becoming immersed in everything a guild offers, from the laughter and tears of regular shared life, to learning the basic construction guidelines and techniques used when making a quilt, is my comfort in quilting. After becoming a mother, I decided not to return to work and instead created a business focused on quilting with divisions in fabric design. The business focused on quilt pattern design for magazines, a book, a line of patterns, teaching and opening a longarm studio. I’ve worked with various fabric companies, in different capacities that ventured into the quilting world from other industries like fashion. Our industry is unique, so having a background in quilting allowed me to develop within its design capacity and outside of the design umbrella. 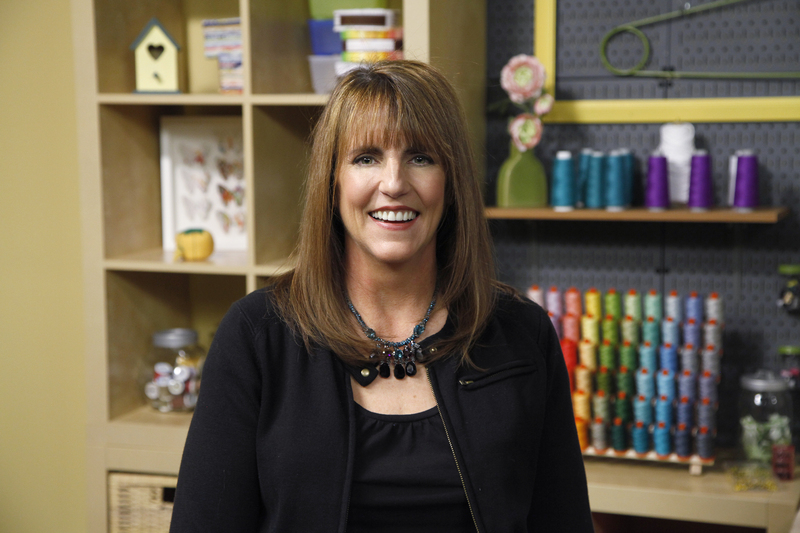 Throughout my career I have developed national quilt challenges, sales programs, guest designer programs and I have received industry recognition for my merchandising abilities. The culmination of all these experiences has brought me to Northcott and has made this position so exciting. Q: What inspired you to create Banyan Batiks? A: Northcott was interested in expanding into the batik market and was looking for someone to spearhead the division. My passion for design and love for batiks made me the perfect match for Northcott’s newest division. After working with batiks, I was inspired to create a line that would stand out and be different from current batiks. I decided to focus on missing elements in the batik market, starting with creativity and design. I challenged every aspect of the batik design process, from color selection and tjap (pronounced “chop”) design to the finishing on the final fabrics. Batiks are more than just fabrics, they are an Indonesian art form and a way of life for the people of Indonesia. As a company, we want to support these businesses and their life style the same way we support independent quilt shops here in North America, by reaching out to small businesses and discussing innovative ideas. Banyan Batiks offers an inventive approach to celebrating the art of batiks in design. Banyan Batiks brings this art form into the quilting market as a fresh new product while still being steeped in tradition. Very much as quilting is in our community. Q: There are a few lines of batiks out in the marketplace already, how is Banyan Batiks different? A: When saying I challenge every aspect of the batik process, I believe that makes us different. To start, I design by collection and typically batiks are not designed this way. Designing full collections makes it easier for sales reps and shop owners when reviewing and purchasing lines. Instead of sifting through 400 different batiks and trying to assemble them together in a cohesive grouping, Banyan Batiks are already set up in colorways and collections. As a designer, it’s incredibly fun to design everything and anything but to achieve a sophisticated and innovative look, reigning in that creativity is necessary. Each of the collections in the Banyan Batiks September line is focused on color, tjap design, and innovative techniques. Tjaps are created for each collection and are reflective of what inspired each line. Typically, tjaps are reused throughout multiple lines in a release but for Banyan Batiks, tjaps are not shared amongst other collections, meaning a tjap found in our Ikat Sketch collection will not reoccur in our Nostalgic Vibes collection. This allows me to use factories effectively while offering a variety of color palettes and collections for shops to buy. Designs from the Nostalgic Vibes collection. Because I’m designing by collection, I am also dictating color within each line, which is very different. Working this way with our factories in Indonesia is something they are still getting used to! 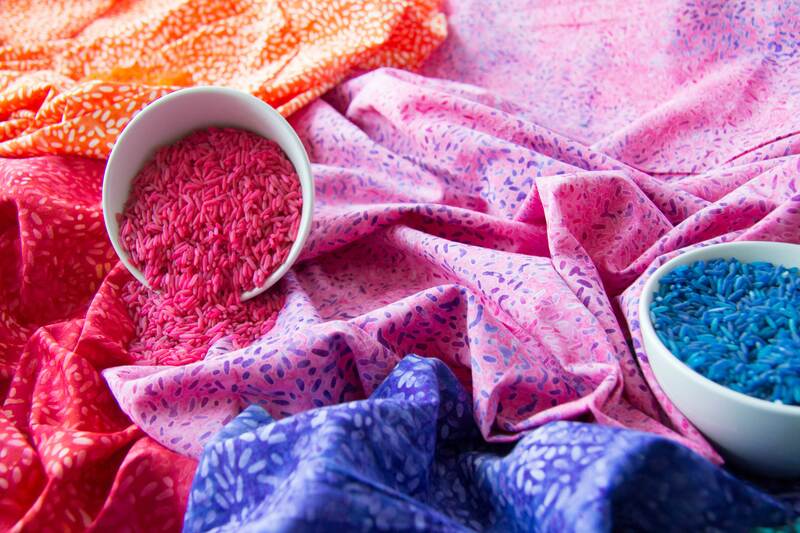 Batik factories typically produce dozens of colors and offer large groupings to fabric manufacturers who then pick which colors they want. By instructing color masters to produce specific colors, I can offer trendy, popular and difficult colors that we don’t see in batiks, filling a gap in the market! Each collection offers an innovative technique that hasn’t been seen before in a batik line. Our Shibori collection is a great example of how different Banyan Batiks can be! This collection is designed and tied like an authentic shibori but colored like a batik. Shibori features 12 differently colored fabrics on 12 yard bolts. The colors range from traditional colors on white, to tone-on-tone colors, to high contrast and a dark, grunge-inspired palette. Q: Do you have a design muse? A: My family and everything I surround myself with is my muse. Northcott has allowed me to create the Banyan Batiks Design Studio here in Colorado, which keeps me in touch with the day-to-day life that fosters my creativity. I find my inspiration from outdoor activities, to the chaos kids create at any age, and the quilting culture that is incredibly strong and embracing here in Colorado. My collections illustrate these points, starting with Visual Sound—have a look at the line, any parent knows that feeling! The intense, in-your-face color compared to the noise and vibrancy of kids! Check out the double tjap application in the checkerboard print with the crayon scribbles! My road trips across America’s heartland and mountains were the inspiration for Primitive Lines. This modern Americana collection features prints inspired by Newspaper Rock in southern Utah and the hieroglyphs I encountered out there. Whereas, Nostalgic Vibes grabs inspiration from the architecture of a family home and the traditions of the Indonesian banyan tree. Designs from the Primitive Lines collection. Designs from the Primitive Lines (above) and Visual Sound (below) collections. Designs from the Visual Sound collection. Q: Do you have any advice for shops on how to shop this line? A: The line was put together on beautiful fabric headers that are split by colorway, making it easy for shops to purchase the whole collection or a single colorway. The Ketan mixer program and the Shibori collection are designed to work with each collection in the release, so they act as the perfect compliment to any purchase. The delivery dates of the collections are staggered each month in 2018, allowing for innovative batiks to arrive every few weeks. Along with the fabric headers is a corresponding catalog – if you don’t already have one, you can view it online by clicking here. The catalog showcases each collection with beautiful photography for all available patterns. Also, at the back of the catalog we’ve included charts to assist when shops purchase patterns for kits. To help shops with limited budgets and shelf space, Banyan Batiks also offers 6 yard bolts when a shop buys a full collection. Q: What suggestions do you have for shops on how to merchandise this line for the full sales potential? A: I am a batik buyer and user. I support my local quilt shops even though I have a stash of fabrics I love. The batik wall in my local shop is incredible to see and when I’m there I must touch every one of them, and maybe even pick up a fat quarter or two of something I just have to have! But when you think about it, it’s not a very big purchase. As an existing customer in your shop, what is going to make me excited to make an impulse purchase or create a new project? As a shop, you already have the newest patterns and fun classes, so how can you intrigue a customer that’s always in your shop? Set up a display of a new, yummy collection, like Visual Sound, so as soon as your customer walks in and sees it they’re either going to do one of two things, buy a 1-2 yard cut of each fabric because a fat quarter just isn’t enough, or after the customer calms down, that collection drives them to your pattern wall for their next project! The ability to merchandise this way is exclusive for brick and mortar shops, but online retailers can post photos of newly arrived collections too! Merchandising with the Ketan and Shibori as the collections arrive in your shop will lead you to reorder these beautiful batiks as they sell through. When trying to attract more of a modern quilter, a sewist and/or DIY enthusiast, you will want her inspired in your shop, without confusing your traditional quilter. Merchandising the Shibori mixed in with Ketan allows for some color relief and the trendiness of Shibori is what will attract your modern quilter. A window display can say a lot to the modern quilter, too. Show Shibori pillows with coordinating Ketan on the back to attract quilters with this current trend! 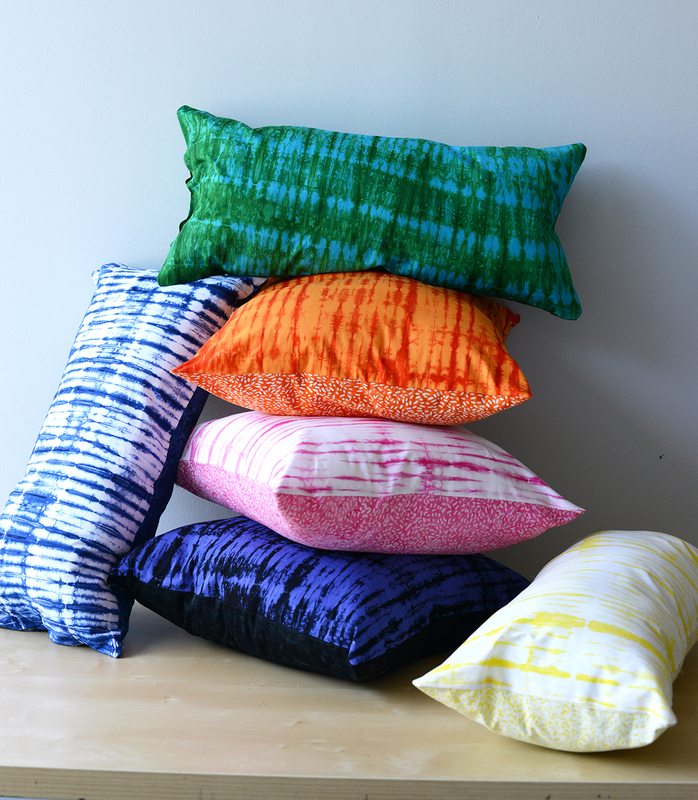 Shibori pillows designed by Gibbs. For the traditional quilter, our Sophie collection is perfect! Maybe she likes some batiks, but isn’t sure what to do with that riot of color normally associated with them. Offering a collection like Sophie that is colored in a watercolor effect, with colors prevalent in cottons, gives your traditional quilter a comfort level not felt before in batiks. 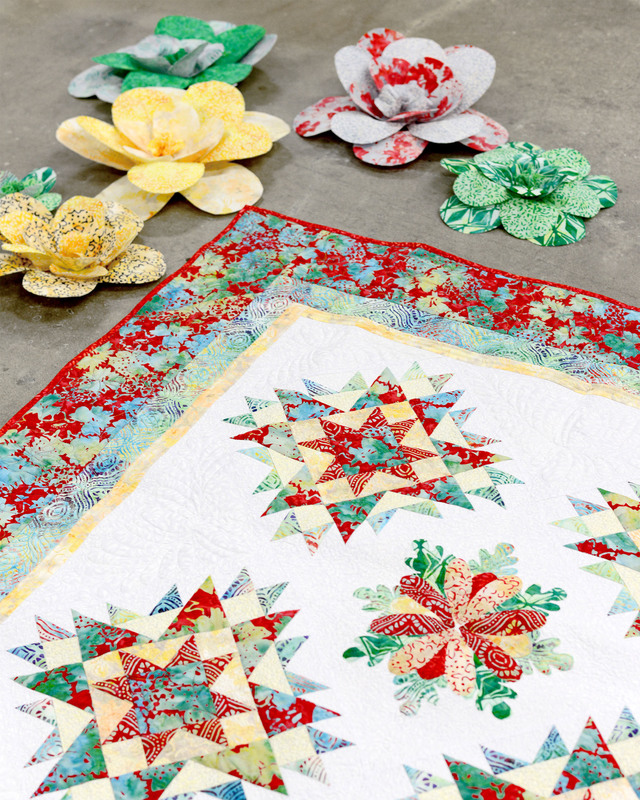 The Sophie collection is perfect for traditional quilters. Q: Will these be considered “basics”? A: Our ongoing and reorderable lines include the Ketan mixer program and multi line, Shadows and White on White. Ketan is the perfect mixer! The line offers a range of colors that include tone-on-tone, high contrast and multi colored prints. Ketan means sticky rice in Indonesian and that’s where the inspiration came from! It’s a celebratory dish that can be seen in crazy colors. When choosing the initial colors of Ketan, I started with neutrals. I felt the same neutral tones were being used over and over and I wanted to see different shades of gray and beige. After I chose the perfect neutrals, I created colors that would mix and compliment the collections. Since I had dictated color for each collection, I knew I was offering a good selection of colors. Shadows is offered in two colors, Licorice and Vanilla, or black and white. Typically, a black batik has a flat look to it, there are so many colors used to achieve black that sometimes it can look like it reads green, blue or even gray. In most art forms, black tends to drain the colors from its surrounding parts. I wanted a black that wouldn’t do this, so this black has lots of the greens, blues and grays in it, but also has movement on its own. I applied the same concepts for the white batik. Since White on White is already a sharp white, I needed a soft white to go with most of the batik tones. White on White is a hand screened process made in our batik factories. Since the tjap wax is colored, it’s difficult to keep the white color in the batik, so we were thrilled when we developed this process that gives us pure white prints on white fabric. The finished product doesn’t have the stiff lacquer finish associated with white on white in cotton. Q: Is there anything else you would like Quilt Shops to know? A: We listened! Northcott has an amazing company culture in communication and when shops and sales reps say batiks aren’t moving or selling-through, we looked at this as an opportunity to create something new and innovative. Northcott gave me the opportunity to challenge every aspect of creative process and in doing so, I’ve designed a line that is truly different. Fabric manufacturers and quilt shops are in this together, so I made sure to listen. As the Lead Designer for Banyan Batiks, Karen makes a great addition to the Northcott team and we are excited to see what Banyan Batiks is offering!